Knight’s Life is a video slot coming from Merkur. This game has a medieval theme with knights as main game symbols. The visual details in the game are decent, but aren’t on a very high level. This is the case with most Merkur slots. It seems that the company is more focused on the bonus features and payouts in their slots, rather than the visual details. Even so Knight’s Life has an attractive appearance and a fun game play. 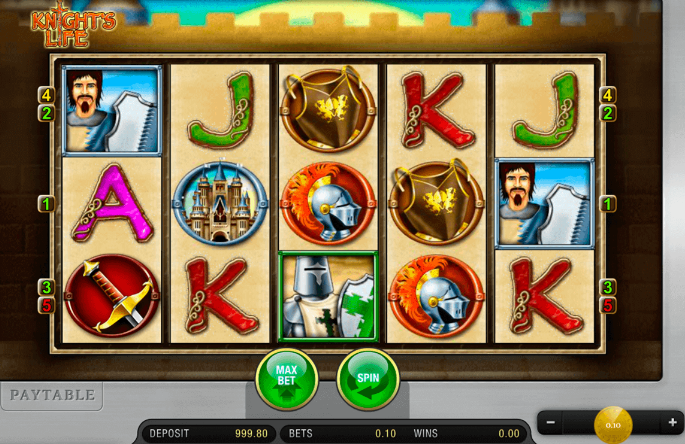 The slot has a simple design featuring only 5 paylines which go across 5 reels and 3 rows. Players can bet anywhere from $0.10 up to $50 per spin. All you need to do is choose the bet size from the left side under the reels. Once your bet is set you can use the Spin button or the Auto Play option to play the game. The Wild symbol in the game is Merlin. He can land on all of the reels and will replace for all other symbols in the game except for the Scatter symbol. He will also double any payout he contributes in. This small detail increases the overall payout potential of the game significantly. This is why players can score some nice payouts even during base play with some help of the Wild. The bonus round in the game is triggered when 3, 4 or 5 Scatters land anywhere on the reels. The player will get 10, 15 or 30 free spins accordingly. During the free spins if 2 Scatters land on the reels the player will get an extra free spin. The free spins come with a very interesting design. As each spin passes by one of the 3 Knight symbols becomes an Extra Wild. With each passing spin a Wild Knight can land on reels 1, 2, 3, 4 and 5 accordingly. Also when the free spins reach spin 6 all payouts will be multiplied by x2. When the free spins reach the 11th spin all of the payouts will be multiplied by x3. This is why it’s best if you trigger the bonus feature in Knight’s Life with a bigger number of Scatters and manage to win a few extra free spins during the feature. This almost guarantees a big payout since all wins will come with a x3 multiplier and the extra wilds can come on all of the reels. In only 1 lucky spin you can get a big payout on the screen.